Let me start by saying that despite living in Phuket, which is well known for it's beaches, we (as a family) are not really beach people. We don't really ever "go to the beach"- certainly not for a whole day, normally just in passing we might decide to take a look, or if I am in a "go for a drive" mood, we might stop at a beach or two. We honestly never visit the main beaches in Phuket, and I suppose the only beach that we visit often would be Khao Kad beach which is home to The Beach Bar, a favourite hangout of ours in the high season (it closes in low season). Maybe we used to visit beaches more often when the kids were small, like 8 - 10 years ago, but even then we preferred small beaches with no crowds. 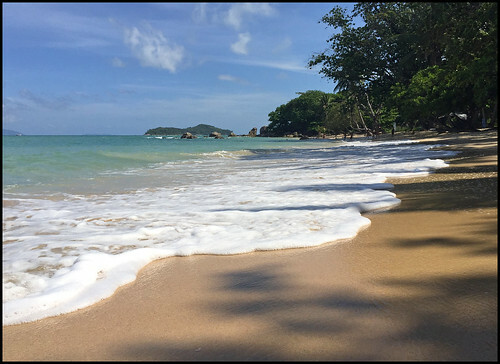 And despite being a very very busy tourist island, Phuket and the surrounding area does have many quiet areas and some quieter beaches. 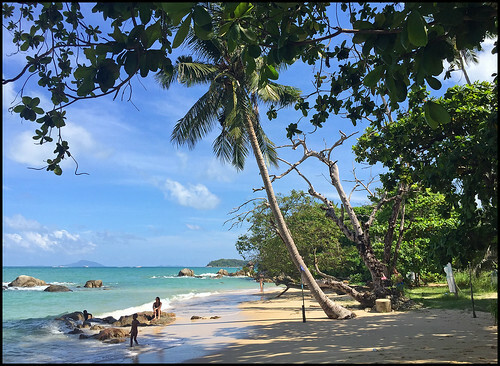 We first found Laem Ka beach in 2006, which was the year I started doing this blog so we started exploring Phuket a lot more. 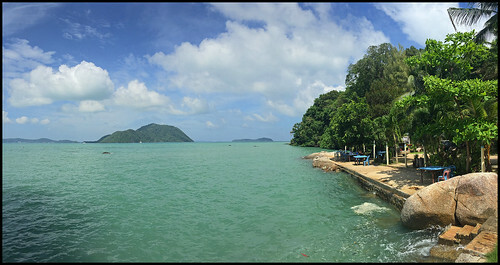 Although we'd been around the Rawai beach area many times, we had no idea that Laem Ka existed! After a wrong turn and directions from a friendly hotel security guard we found this lovely quiet place and (for once) we even stayed a while and let the kids play at making sandcastles. 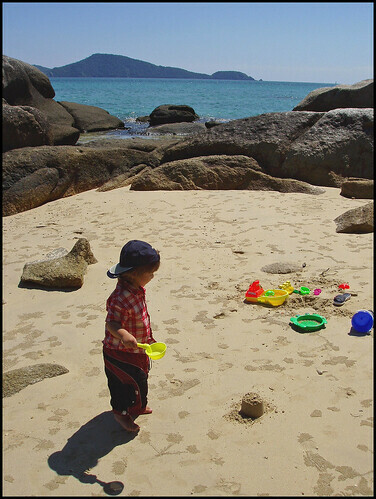 (above) Our little boy at Laem Ka Beach, November 2006. (above) Road to Laem Ka Noi. 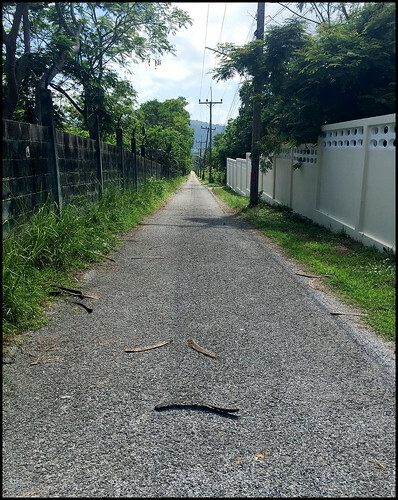 It's about 1km down this very narrow road, and then you hit a twisty concrete track heading slightly downhill and then (promising) a sign to Laem Ka Noi Seafood. An even narrower road heads steeply downhill. I parked near the sign and walked down. And saw some old tables by the sea. Like a 10 year old memory. Now, there was one table occupied by a couple, and the table had some plates on it, but aside from an old man in a hut above the sea, I saw no restaurant, no staff, no menus. Nobody came to ask if I was hungry or wanted a drink. If this place really is a restaurant, it holds it's secret well! So, that mystery has yet to be solved. I drove back to the main road and then the turning to Laem Ka is just 400m further towards Rawai, just after a 7 Eleven store and opposite the entrance to Rawai temple. 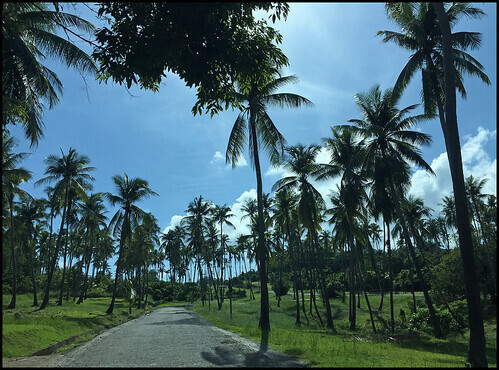 The 1km drive passes through the back of Rawai village and then you come to a security barrier (open) and then drive through a beautiful piece of land full of coconut trees. It's private land and there are signs on trees saying "No Photo". Whoever owns the land has granted right of way to the beach. (above) Road to Laem Ka Beach. The car park is still bare and dusty. There is still an old open front shack above the beach as there was 10 years ago, but no sign of any vendors selling food or drinks. A few steps lead down from the carpark to the sea. It was high tide, plus (being low season) a few waves. The rocky area (see photo below) where my kids played 10 years ago was not accessible. I may have to come again at low tide for more photos! Crowded? No. People had told me about speedboats, but maybe because it was low season and there are often a few small waves, it's not safe for the speedboats to land .. I'll have to check again in high season. The rocky area (with patches of sand) is to the right of the steps. With that being underwater, I turned left. There was 1 local family there, plus 2 foreign couples (another couple arrived later with a guide/driver and only stayed a few minutes for a photo) and there was a bunch of little local kids - some clothed, some not - running around playing football and jumping in the sea. A sunny low season day would seem to be ideal for a visit to Laem Ka beach! The whole beach is only about 150 metres long. The rocky area is at the south end, and at the north end is a rather dilapidated looking building. Just north of that is the old Evason resort which closed a few years ago, but is due to re-open in 2019 as the Intercontinental Phuket Resort. There are some basic wooden stalls at the back of the beach. Nothing was open when I was there, but maybe in high season there are vendors for the tourists coming in by speedboat? 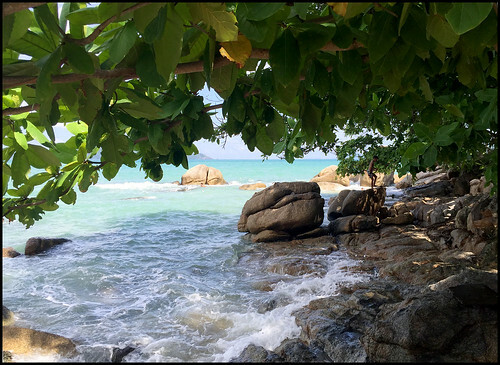 On the day I visited (a not-so-uncommon perfect blue sky low season days) Laem Ka beach was paradise!